Well this was not something that I had planned on reading this month, but thanks to Simon at stuckinabook I downloaded it to my kindle yesterday after reading his excellent review of it. So far it is only available on kindle – and at just 77p is really rather a lovely little bargain. I got stuck into it myself straight away.In many ways this short little book is not my usual kind of thing at all. However I needed something light and bright after the pall cast by the sad but utterly brilliant Mrs Palfrey at the Claremont. This novel is a cleverly written work of imagination. With more than a nod towards Lewis Carroll’s Alice, it is a surreal yet touching coming of age tale. With references galore to jam tarts, white rabbits, pocket watches, lateness and snarks, this is a book that will delight the Lewis Carroll aficionado.Violet lives in a quirky eccentric household in Oxford. A strikingly tall girl, who started off very small as a child, she has a wonderfully close relationship with her grandfather, Julius who now lives in the basement, and once wrote a famous book. Now Julius is developing dementia and writes haiku on scraps of paper. It was true that it was a most impractical house. Violet’s family lived in a higgledy-piggledy house with seven floors, because no two rooms were level, but each was connected by a set of stairs to the other. The house was also full of doors here and there of all shapes and sizes leading to cupboards and passages or to nowhere at all. There was not a single right angle in it. Under every piece of furniture was wedged a notebook or a folded handkerchief to stop them from wobbling on the uneven floors. Every breakable object was stuck down with glue or adhesive tape. Not even the pictures on the walls could be balanced in such a way as to hang straight.We see the world through the eyes of a growing Violet, it’s often an odd world, a conversation with a dodo and an elephant bird at the British Museum just one example of the author’s marvellous imagery in this novel.When Violet’s family suddenly tell her that she has lost her spark, Violet realises she must find out who it is she really is. With her grandfather slipping away into dementia – Violet is forced to do this by herself.A quick, light read, with a poignant sweet little ending, I am glad I got to read something different, and must thank Simon for introducing me to it. This charming and unique book is a combination of a realistic portrayal of a shy and insecure young girl finding herself, and some almost magical realism touches. It's left intriguingly ambiguous whether things like sightings of a talking rabbit or a cake that affected the course of a life are due to the main character's over-active imagination and romanticism, or whether the seemingly real-life setting actually has some magic in it. There are some serious points about family and bereavement and growing up and even the slightest hint of an eating disorder, but as it was all wrapped in a tale of the imagination, it never became heavy handed or preachy. There are also plenty of fun literary references, predominantly but not exclusively around Alice in Wonderland. 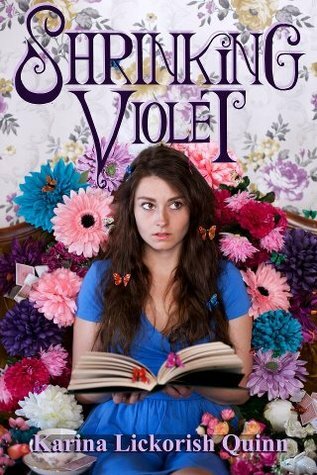 Anyone who has ever sat and daydreamed in class or has a talent that they've kept suppressed will be able to identify with the lovely main character, Violet. I also really liked her glamorous sister, who initially seemed like a snooty and uncaring stereotype, but turned out to have hidden depths and sweetnesses. Oddly enough however, I found it hard to like the Grandfather, who seemed to have been a fairly distant husband and then a rather rude houseguest. I was definitely team Grandma in their quarrel and I wished Violet could love her as much as him. This seems to be aimed at the roughly 9-14 market, and I'd say it's a must read for any intelligent readers in that age group. As a short and charming read (I read it in an afternoon) it's also a treat for any adult who has an imagination and is looking for something a bit different. A brief but affecting story of a young girl and her relationship with her grandfather, who is struggling through the onset of dementia. With more than a slight nod towards Lewis Carroll, Violet inhabits a surreal world where reality seems more elastic, more magical, more open to interpretation than the world we're used to, but KLQ has an exceptionally deft touch and manages to keep the story grounded and relatable. A really enjoyable read, with a supporting case of characters who pop out of the page (or Kindle screen) with unexpected alacrity. A great first novella.